This is actually a drink made in Canada, maybe to compete with Red Bull? 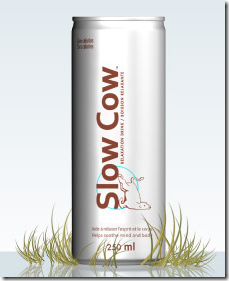 According to their website, Slow Cow™ is a relaxation beverage that helps in the improvement of concentration, memory and learning capacity without causing sleepiness. 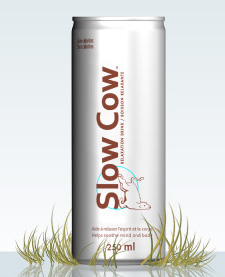 A one of kind drink made in Quebec, Slow Cow™ contains no calories, no caffeine and no sugar. The benefits provided by its 8 natural ingredients are numerous. First of all, L-Theanine promotes relaxation, improves the brain’s capacity to concentrate, learn, memorize and it increases cerebral levels of dopamine, the neurotransmitter responsible for pleasure. Chamomile is reputed for treating insomnia; Passiflora induces relaxation. Valerian, Linden and Hops are acknowledged to help reducing nervousness. Sodium decreases fatigue during exercise whereas Potassium, that is essential in the transmission of nerve signals and in muscular contraction, takes part in the proper kidney and suprarenal gland functions. I am all for natural ingredient food and drink because nowadays, you really don’t know anymore if what you’re eating is natural or not. In fact, more likely than not, the food we are eating now is processed and processed beyond recognition. It’ll be interesting to see if Slow Cow™ can win in the psychological department. I actually quite like the idea of going for a 10am coffee. Coffee makes me feel like I am taking a break, that I am relaxing, that I am getting the extra boost to tide me through the day. This is regardless of whether the caffeine has done its job. I actually think I am quite immune to coffee already and I drink it only for the associated feelings mentioned above. I don’t know if I’ll take to the idea of going on a Slow Cow™ break. Still, they definitely picked the right name for the drink because I noticed it (and so did you).